Boutique Guesthouse accommodation in the heart of Byron Bay. Welcome to your home away from home. 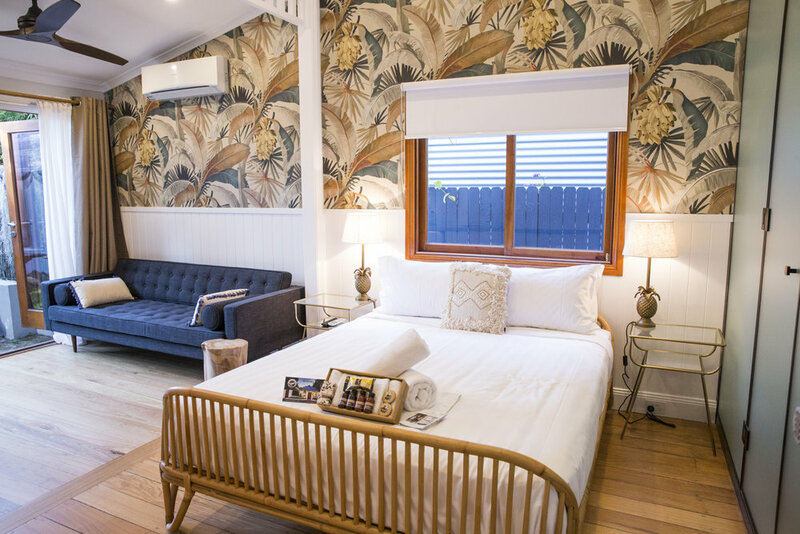 Our boutique guesthouse set amongst lush tropical gardens is sure to be the perfect destination for your visit to Byron Bay. Built in the 1930’s as a whalers cottage and beautifully restored just recently, Bayhaven Lodge holds a great deal of history and charm. It is centrally located in town with a quick stroll to Byron’s many shops, restaurants, cafes and world famous beaches. Being a small family owned and run guesthouse we pride ourselves on our personable approach and have taken the utmost thought and care with our rooms and facilities to ensure a unforgettably relaxing and enjoyable stay. With 4 uniquely different styles of accommodation there is something for everyone at Bayhaven Lodge. Just For You. Or Bring The Crew Along. My husband and I spent 2 relaxing nights in the Grand Suite. This Suite is stylish and comfortable. We loved relaxing during the day on the quiet back deck. And at night there were plenty of stars. The managers were friendly and helpful. Bonus - a very short walk to town. PS We took a peek at the smaller Garden Suites. They are super attractive.